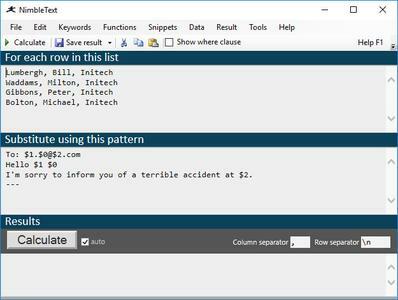 NimbleText is a very small, easy to use but powerful application that will help you to easily manipulate text and data. NimbleText is a very simply code generator. It formats your data using the patterns you supply. NimbleText saves you time and takes the drudgery out of repetitive data manipulation. NimbleText puts you in control of the text you are manipulating.